Mt. 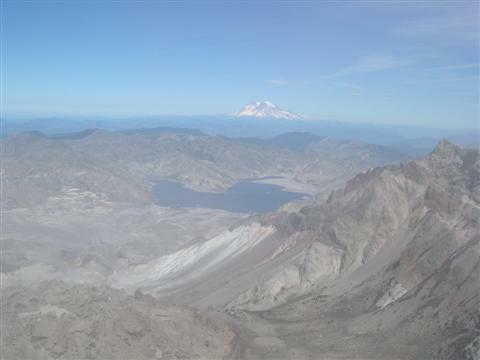 St. Helens in southwest Washington state erupted on May 18, 1980. In a matter of minutes, Mt. 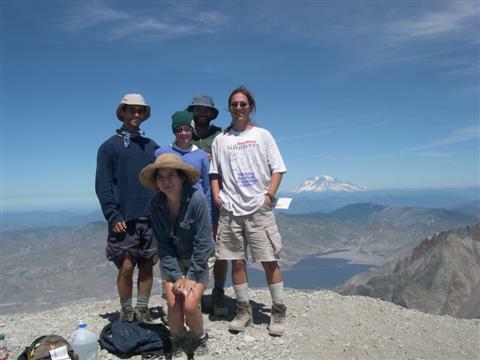 St. Helens lost 1,300 feet off its top. A lateral blast through a bulge on the north side knocked down most of the vegetation for about 17 miles. 200 square miles of pristine land was totally devastated. Glaciers melted, causing massive mud flows. The eastern side of the state went completely dark in the middle of the day from the thick blanket of ash carried on the wind. When my wife, Tammie, posed the question of where to vacation this past summer, our daughter Katie suggested Mt. St. Helens. My initial thought was that this would be a wonderful opportunity to see if Sedums had made a comeback since the eruption. After a family vote, the decision was unanimous. We packed up our camping gear and set off for the Mount St. Helens National Volcanic Monument. Our first stop was Jack's Restaurant and Store in the small town of Cougar near the south side of the mountain. To keep the environmental impact to a minimum, the National Park Service limits the amount of people climbing the mountain to 100 per day. Advance reservations for up to 60 people per day can be made beginning February 1st. They hold a daily lottery at 'Jack's' where names are drawn for the next day for any of the spots not spoken for with reservations. While we were waiting, a boy scout leader who had made reservations for his whole troop stated that several of the boys were unable to come. The lady behind the counter said that what a person does with his unused reservations is his own affair. The troop leader gave away his extra reservations to us and a few other people that were waiting to sign up for the lottery. We managed to purchase, at $15 per ticket, enough tickets so everyone in our group could make the hike the following morning. The most commonly used path up the mountain is the Ptarmigan Trail on the south side of the mountain. The trail starts at a rough campground at 3,700 ft and gains 4500 feet in 5 miles. Above the treeline, the path was marked by occasional large wooden posts, which continued to about 7000 ft. The last 1300 ft was unmarked ash and pumice. There were 6 of us hiking that morning. My children, Chris and Katie (19 years) and Nick (21 years), our friend Elizabeth, my wife Tammie and me. Tammie planned to hike to the treeline and then head back down again so that she could locate our next camp. It was a beautiful clear sunny day, perfect weather for climbing a mountain. The first 2 miles were relatively easy. Alpine Fir, various ferns, mountain blueberries and heather lined the path. As we hiked I kept my eyes peeled for Sedums. Volcanic ash was evident on and beside the trail. Soon, the trees began to thin and the view behind us opened up. There was an awe inspiring panorama with 2 large snowcapped mountains off in the distance. At about 4500 ft was a modern composting pit toilet for hikers. We decided to leave 1 of our gallon jugs of water in the woods near this point so that we would have some for the trip down. Soon the trees were behind us and it was time for Tammie to head back. Up ahead was the biggest rock slide I had ever seen. There was really no path as such through 11/2 miles of very large boulders. Instead of hiking, we found ourselves scrambling up and between boulders for the next 2 hours. As there was no path, we were continuously having to decide on the best route to take, sometimes making the right decision and sometimes not. In the gaps between the boulders were pink mountain heather (Phyllodoce empetriformis), sulfur buckwheat (Erigonum umbellatum) and a mat-forming evergreen known as partridgefoot (Luetkea pectinata). Partridgefoot reminds me of some of the 'mossy' Saxifragas that I grow at the nursery, with fine textured dissected green leaves. As we gained in elevation, it appeared that there was no more plant life until I noticed some greenery in a narrow space between a couple of boulders. After closer inspection, I noted that the green plant had a low spreading habit with very succulent sausage shaped leaves. 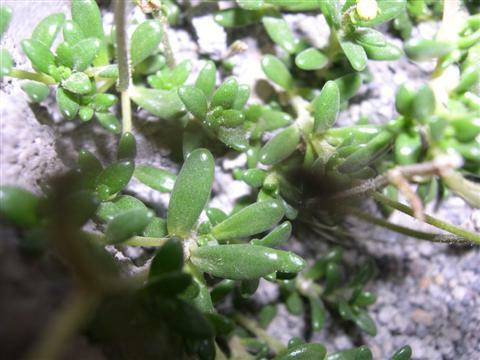 The plant was very Sedum-like in appearance with the exception of the blossoms. Fortunately I had my field guide with me and was able to identify it. The mystery plant was Tolmies saxifrage (Saxifraga tolmiei), a plant that can survive with a very short season, often being covered by snow until as late as August. 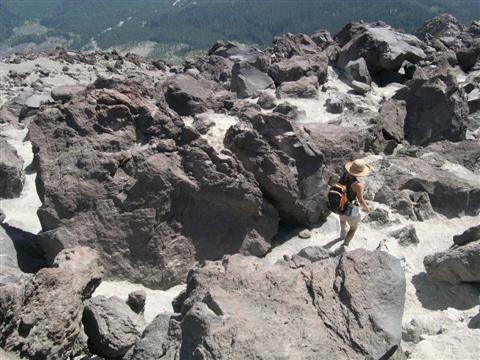 Eventually, we made it to the end of the rock slide where the path became a steep ash and pumice traverse. It felt like we were taking 1 step forward and 2 steps back on a steep hill of pumice, sand, and ash for the next hour. Chris, Nick and Elizabeth were in the best physical condition and managed to get way out ahead of Katie and me. In this wide open area we could see many other people heading toward the top. This was the final stretch and Katie and I were finding ourselves having to take short breaks every 20 or so steps. Some of the people at the top were suggesting that we run the final little bit, but it didn't seem like an attractive option to us. Soon we were at the top on a narrow crest looking over the edge of the crater toward the devastation on the north side. The air on the north side appeared to be hazy. As we watched for a while, the cause of the haze became apparent. There were numerous ash and rock slides taking place during our half hour stay at the top. The view was stunning. To the northeast, an enormous gray barren landscape as far as the eye could see. In the crater below, we could see the lava dome, a large gray mound that is a reminder that Mt. St. Helens is still quite active. Off in the distance we could see the remainder of a totally reshaped Spirit Lake. Toward the horizon, in various directions we could see 5 different snow capped mountain peaks of the Cascade mountain range. After an enjoyable lunch break atop the volcano, Katie and I started back down the mountain, thinking that we needed a head start so that we wouldn't be left in the dust of the other faster hikers. We found that bandanas worn like masks in an old Western kept the ash that we were stirring up on our rapid descent out of our noses and mouths. It wasn't long when the others caught up with us. They were using their cross country running experience to advantage in a very rapid descent. When we arrived back at the rock slide, we all met up for a short water break. Soon we were split up again. Katie and I managed to get a little off the marked route as we were trying to find the easiest way through the boulders. About of the way through the slide, Nick called on the walkie talkie. Reception was poor and we could only hear some of the words. "Chris fell.... rocks...broken bones..." I went into panic mode. I tried to get more information from the others but the reception was too bad. Katie and I covered a lot of ground in a short amount of time as we cut sideways across the rock slide to find the rest of party. I had pictures in my mind of a search and rescue helicopter taking my son off to the nearest hospital. It would be very difficult to carry a person over the boulders to treeline where the real path returns. It wasn't long before we found them. Elizabeth was putting a large bandage on Chris lacerated palm. It turned out he was OK with the exception of several bruises and a fairly nasty cut on his hand where a sharp boulder that he fell on sliced him. The message on the walkie talkie was actually something like "Chris fell on the rocks. He cut his hand. No broken bones." The rest of this hike was uneventful. I was a little sad at not having found any Sedums but tomorrow would be another day. We arrived back at camp 8 hours after we started. Tammie found a vacant camp site to move to but since our hiking pass allowed us 1 more evening, we decided to stay one more night, being too tired to set up a new camp. The next day we moved to campground on the shores of a lake south of the mountain. The kids spent a lot of time in the water. The majority of the day we spent hiking through the Ape Caves, which is the 3rd largest lava tube in the continental US. No Sedums there. On our third day of camping we decided to check out another hiking trail. It was called the Lava Canyon Trail, and was located near the south east side of Mt St Helens. 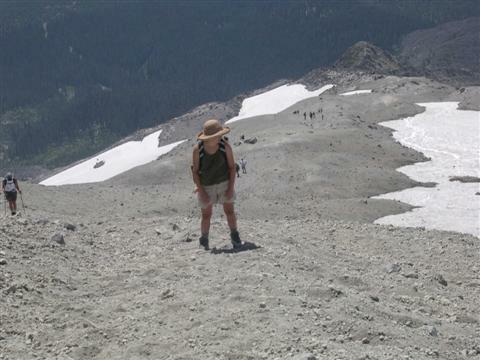 During the eruption of 1980, mud flows were formed when large portions of the glaciers on the east side of the mountain melted. As a slurry of mud, trees and boulders rushed down Lava Canyon, the floor of the canyon was scoured clean of all topsoil and vegetation. What remained were solidified lava flows that had formed in an eruption 1900 years ago. 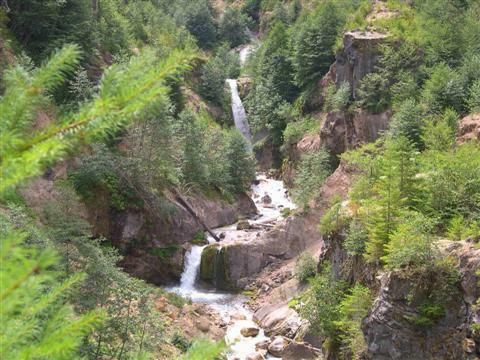 Today a river flows over the basalt in a series of breathtaking waterfalls. The hike is about 6 miles roundtrip, starting at around 3000 ft elevation with the bottom end of the trail being 1570 feet. The first half mile of the hike is paved and handicap accessible. As we were walking down the first part of the trail, a park employee stopped and asked if we had any questions. I asked if she knew if there were any varieties of Sedums along the hike. She said that she was pretty sure there weren't, but I had a feeling that she didn't really know one way or the other. At the end of this relatively easy part of the trail was a wooden platform that overlooked a large area of exposed basalt with the Muddy River squeezing its way through tight corridors in the rock in a series of small waterfalls. Past this point, the trail becomes dirt. The next half mile of trail is considered of a medium difficulty. After walking a short way down the path at around 2500 feet elevation off the southeast side of the trail, I found a large grouping of Sedum oreganum growing on an area of rock that had an accumulation of organic matter and moss built up on it. I made the rest of the group wait while I took photos. 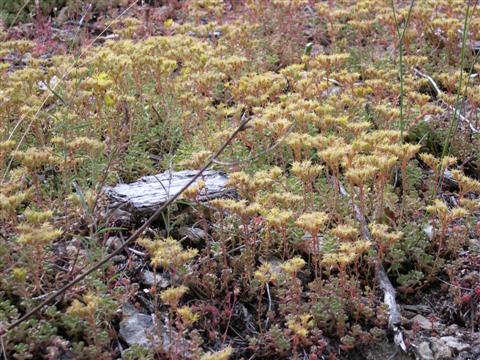 The Sedum oreganum covered an area 20 feet long and between 3 and 8 feet wide. Numerous bright yellow flowers hovered above the glossy foliage on branched wiry stems, promising a bumper crop of seed. What a find! At the end of the medium difficulty part of the trail is a pedestrian suspension bridge that crosses Lava Canyon. The floor of the bridge is made up of spaced planks that allowed us to view the raging Muddy River by looking down at our feet. There were cables to hold onto as we crossed. No matter how lightly we walked, the bridge rocked and rolled, making crossing a very unnerving experience. Once on the other side of the bridge, there was a choice to make. The trail split at this point. If we took a left, the trail would take us back up to our starting point, but on the opposite side of the canyon from which we came down. If we took a right, the path would descend through the steepest most difficult and dangerous section. Several people have died after slipping off the narrow path into the river which carried them over the falls. Tammie and Katie opted to take the path up while Nick, Chris, Elizabeth and I chose to continue on down the trail. As we continued down the trail we found ourselves holding onto the steep rocky hill on our left side. The path was so narrow that a person would need to flatten against the hillside to allow someone to pass from below. To our right was a sheer drop to the river at the bottom of the canyon. 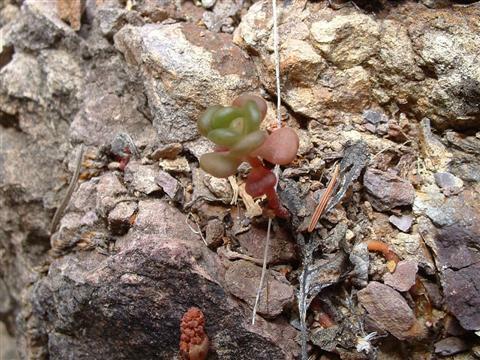 Once, as I reached out along the rock wall, I nearly crushed an 8 inch grouping of Sedum oreganum that appeared to be growing right out of the rock. 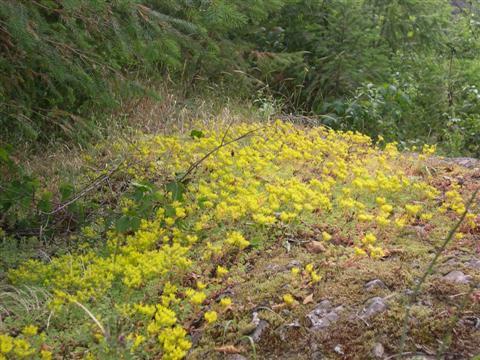 After hiking another 5 minutes we came to another large patch, 20 feet by 20 feet, of Sedum oreganum. It was on our left (north) side where the steep hill nearly leveled out. The grouping was growing out of loose rock that had sloughed off the rock on the hill above. Bleached tree branches were scattered throughout. Except for the Sedums, all of the other plant life in this rock bed was wilting or defoliated from the drought here this summer. Many of the leaves of the Sedums here were pink or reddish from the stress. Almost all of the blossoms were spent, leaving clusters of carpels plump with seed. A little farther down the path, as we were hugging the wall, right at eye level was a single rosette of oreganum growing out of the rock wall where the rock was somewhat broken. Two roots that were about the same diameter as the stem, emerged from the rock for an inch or so and then plunged back in again. Either the roots were exposed by water or they found themselves with nowhere else to go and moved through open air until they found another opening in the rock to enter. We passed many more groupings of Sedum oreganum in the next few minutes and I took photos on the hoof so as not to slow down the other hikers who had been quite patient with my need to stop at every little Sedum. Soon we found ourselves at a point in the trail where there was a 30 foot drop straight down. 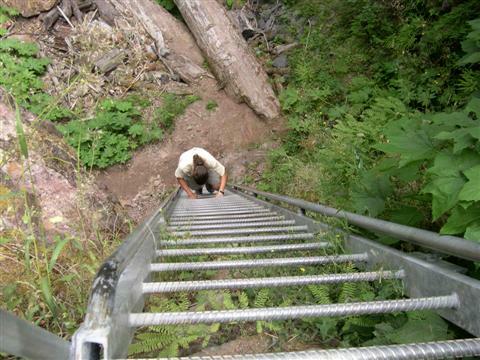 The forest service had bolted a metal ladder to the basalt rock to solve the problem. At the bottom, the ground was much more damp. 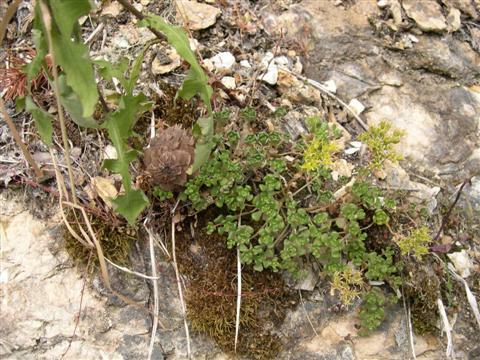 The flora changed suddenly to moisture loving plants such as maidenhair fern (Adiantum pedatum), piggy-back plant (Tolmiea menziesii), coltsfoot (Petasites palmatus), and horsetail (Equisetum). The trail became much easier at this point. Soon the trail turned sharply to the right and uphill. Before we knew it we were on a knoll in a clearing viewing the beautiful waterfalls. The Muddy River (it's actually crystal clear) cascaded over and over in a series of breathtaking waterfalls, down the basalt rock that was exposed during Mt. St. Helens last eruption. It was picture perfect. The hike back was arduous, being uphill all the way. I stopped at the Sedums along the way to take a few more pictures. I had hoped to find other species such as Sedum divergens and Sedum spathulifolium but they eluded me on this trip.